MEI Blog: Should journal reviewers be rewarded for their efforts? Should journal reviewers be rewarded for their efforts? Way back in 2011 I asked journal authors for their opinions on the peer-review process. Overwhelmingly the response was very positive- the system has some deep flaws but it is essential for the advancement of science. I wonder if researchers feel the same way eight years on. 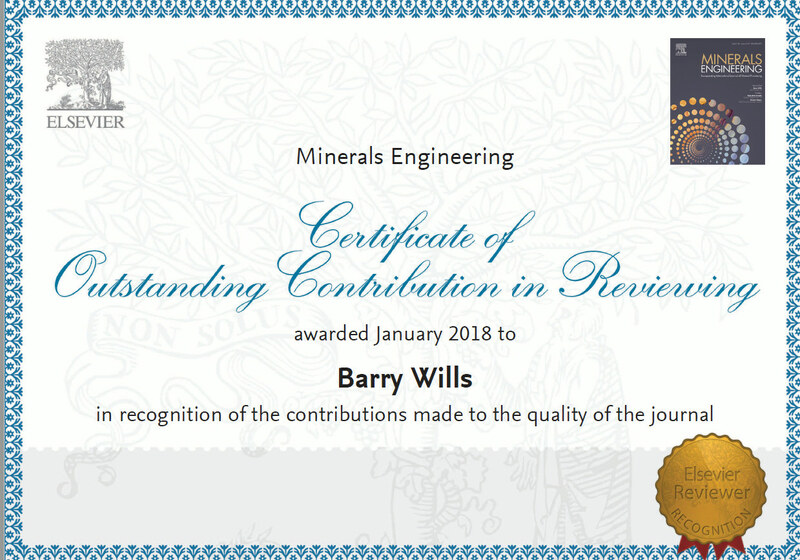 Are there any issues with the new editorial structure of Minerals Engineering for example? Very few correspondents suggested that reviewers should be financially rewarded for their time, the feeling being that self-respecting scientists would agree that being part of the peer-review process should be a responsibility of any serious scientist, and part of the job description of a researcher. However, reviewing a paper can be a time-consuming process. According to results from a 2015 survey conducted jointly by Elsevier’s Customer Insights team and the Publishing Research Consortium, researchers spend a mean time of more than a full working day on reviewing a single manuscript while the modal number of manuscripts reviewed per month is 1-2. It goes without saying that the least journals can do is to demonstrate their appreciation for such an invaluable effort in some way. “My Elsevier reviews” profile gets automatically updated each time a referee submits a referee report via one of Elsevier’s journal submission systems, removing the need for manually logging and claiming activities. Access to the private profile page is via means of an encrypted hyperlink, sent to the reviewer by email. Reviewers who complete just one review in a two-year time period can download a certificate for 'Recognised Reviewer' and those who are in the top 10% become 'Outstanding Reviewers'. See below for my examples (I have refereed only one paper for Hydrometallurgy, and the same for IJMP). The only financial reward is that reviewers can claim 25% discount and free shipping on Elsevier's print and e-books, and 10% discount on article- , illustration- , translation- and language editing services. What do you think? Does this incentive provide sufficient acknowledgement of the time spent on reviewing? Do you feel that rewarding reviewers in this way is not necessary, as peer-review should be seen as a reciprocal arrangement between researchers, an essential part of every worker's remit? Thank you Barry for this post. To write a very good review, which does not criticize a manuscript, but improves it by proving constructive comments, takes a lot of time and effort. Many researchers spend their private time on reviewing. Therefore, a small reward, such as a small voucher for an open access publication, a discount for books and journals, a certificate etc. is very welcome. If purpose to improve quality of papers then yes. But important is quality acheived rather than time given. Bcaz I saw many people accept to reveiw without any expertise and editor find it conveient considering availability of suitable reviewer. So it is equally important to award people who find the issues in the printed papers. So every year conduct a online event ' Review the Reviewer' where readers can submit the all type of issues they see in printed articles. All can be keep confidential till disclousure of awardees. Very tricky issue and it is more so these days. In earlier years, Academicians used to spend most (if not all)time on academic activities and used to have smaller number of scholars. But these days they are involved in more administrative and other activities like attending meetings at other places etc and travel a lot. So the time they can really spend on reviewing is getting affected. The same problem on examining a Ph.d. thesis. The above does not mean we do not need review.The Certificates being issued are a great idea-- an upcoming academic person may add that to his C.V. for his promotions as a recognition of his standing for knowledge.Please continue. Barry, I really do not have an answer. These days money is no more an incentive.Perhaps your writing directly to top Institutes from where you select these reviewers, may help in the Institutes to take this as a parameter in their assessments of Academicians.Seeing their names appearing once an year in a Blog like yours may enthuse them more. Thanks for this TC. The blog is not the place to list names of reviewers, but Minerals Engineering does list the names of recent reviewers in each issue. As far as I know this is the only mineral processing journal which does this. 1. To determine if a paper is acceptable for publication. 2. To assist the author improve the quality of the paper. In my view the primary purpose of the reviewer is 1. They should not be expected to spend considerable effort bring a paper up to standard. They should of identify errors , etc. Once I was asked to review a paper, and I considered that the author had not performed an appropriate literature review. Consequently I declined to review as I did not see it as my role to do a lit. review for them. I did however contact the author later on (independently), and mentioned that they should improve their literature review, and they simply weren’t interested. All they cared about was getting published (which they did)! 1. Academics should see reviewing as part of their job. If Universities are discouraging Academics from reviewing journal articles then the Universities are not truly supporting academic activities. 2. For non-academic reviewers (i.e. consultants) it is not a straightforward to find a solution. I do not think monetary benefits are reasonable incentives. Instead if a reviewer has made substantial intellectual contribution they should be named in the acknowledgements, or perhaps even given joint authorship (if the contribution is substantial). The latter would be difficult to manage, but as I said why should a reviewer help the author (substantially) to bring the paper to acceptable standard? I agree with most of the comments of Stephen. Let us even think whether the papers in the present form and format are the best way to continue. Should we encourage more of Technical Notes(shorter versions). Many times I see too much of introduction and literature--too many graphs along with Tables of data. Can the Author come straight to the point,come to precise conclusions based on only relevant data. May be that is what is happening but I feel whether we can think a different Format away from conventional.